We got access to the PC version of Call of Duty: Black Ops 4 ($60 on Humble) at the same time as the rest of the world, so I’ve been playing catch-up all day. Don’t ask me why Activision didn’t make it available ahead of release. I expected it to be truly broken given the circumstances but...nope. Everything seems fine, at least on a technical level. 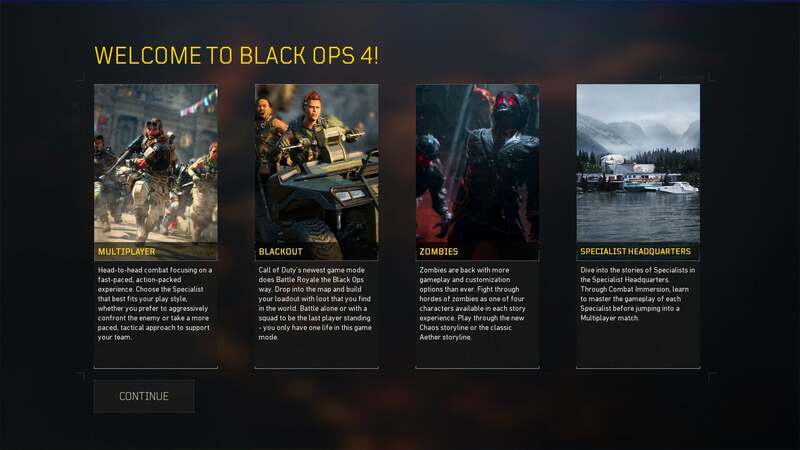 Of course, reviewing Call of Duty is a lot easier this year given Black Ops 4 doesn’t have an actual singleplayer campaign, and the Blackout battle royale mode had a beta last month. I’ve spent some post-release time with Blackout though, plus a bit of time in traditional multiplayer and of course this year’s time-traveling Zombies stories. Here are my thoughts so far, separated by game type. First let me reiterate, I really do wish Black Ops 4 had a singleplayer campaign. That might make me an outlier, but I’ve played every Call of Duty campaign over the years (even Ghosts) and at least moderately enjoyed them. Some are downright fantastic, including both Black Ops and Black Ops III. The answer is apparently: You don’t bother trying. I don’t know what was planned for the Black Ops 4 campaign, I don’t know why it fell apart, and I don’t know whether the inclusion of Blackout mode was to blame. What I do know is that every multiplayer map feels like it comes from a different game. Mechanically of course there are some Treyarch trademarks. 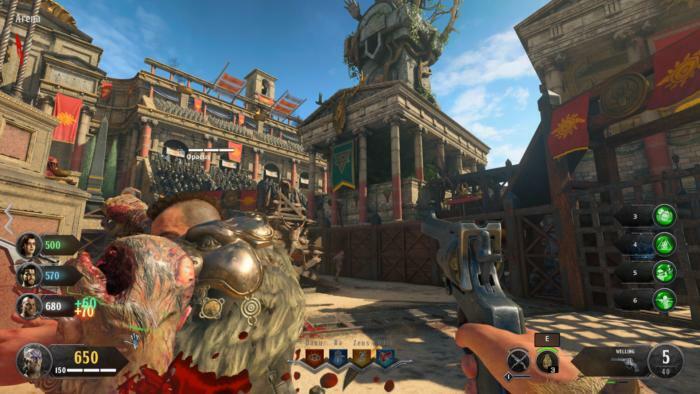 Movement’s faster than in last year’s WWII, and Black Ops 4 brings back “Specialists” from the previous Black Ops game—basically hero-type character classes. Instead of grenades you might have a grappling hook or a shield or even a dog buddy. It’s indicative of how much the shooter landscape’s changed the last few years, what with Rainbow Six Siege and Overwatch and so on. But I’m not convinced the idea works as well in Call of Duty, or maybe the implementation just needs work. 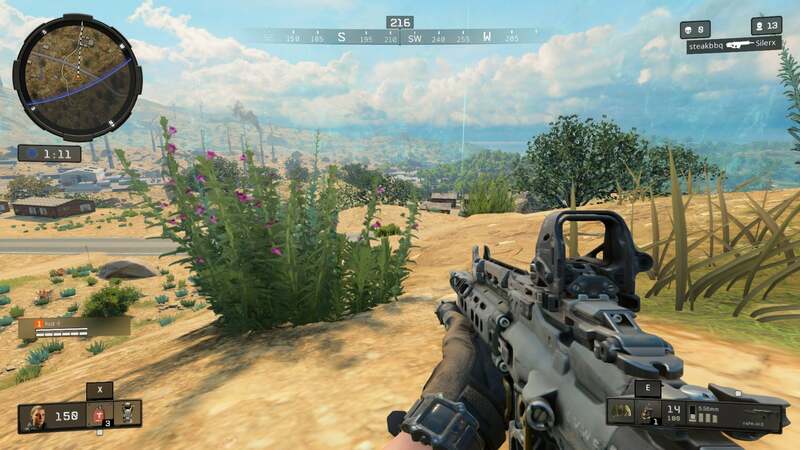 In practice you see people playing the same two or three characters constantly, because in fast-paced Call of Duty multiplayer items that highlight enemies on the map or grant everyone a temporary health boost are game-changing. Ultimately the biggest question is whether you still enjoy Call of Duty’s multiplayer though. Me? I played quite a bit of WWII despite not loving the maps, mainly because I like the slightly slower pace of play and the feel of the weapons. Black Ops 4? I played some rounds, I had a decent enough time, but it’s not drawing me back in. It feels a bit too manic to me, same as the Infinite Warfare era. That’s personal preference, of course. On a more objective level I think it’s a perfectly competent version of Call of Duty multiplayer. I’m just not finding a hook this year. I should also mention I’ve seen a lot of complaints about spawn-camping, especially in the new Control mode. Some maps are incredibly easy to lock down. I expect those sorts of issues will get ironed out in the next few weeks though as Treyarch takes a look at the metrics. It’s the “Why should you care?” question that interests me more, and in the case of Black Ops 4 it really comes down to how much you like Treyarch’s specific take on Call of Duty multiplayer, sans-campaign. Zombies at least stands on its own, and thus is less affected by the lack of a campaign this year. Treyarch’s “Aether” storyline continues for those who are invested in that lore, though to me the bigger draw is the new “Chaos” storyline—a pulpy time-traveling romp that takes players to the Titanic and to a Roman colosseum. These are undoubtedly some of my favorite Zombies maps from a purely aesthetic standpoint. 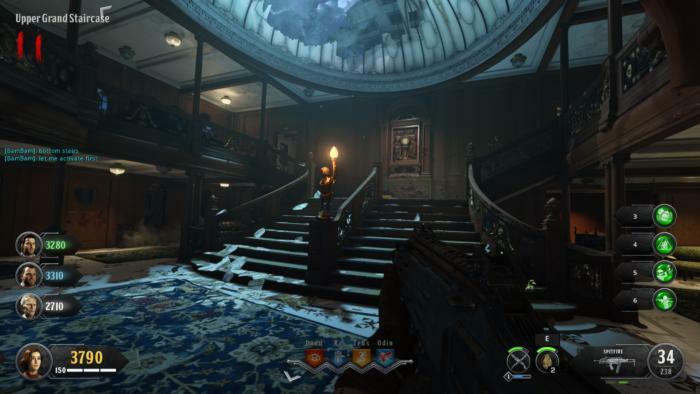 The Titanic map, titled “Voyage of Despair,” starts with the ship hitting the iceberg and then turns into a zombie-killing brawl across six or seven different decks. The colosseum map, Ix, includes zombie tigers and plate-armored brutes and an entire crowd of cheering onlookers. As someone with just a passing appreciation for Zombies, these sorts of visual hooks are my favorite. I love circling around a sandy arena, machine gun in hand, mowing down zombie gladiators. And on the other hand, Black Ops 4 changes so much I’m curious whether it’ll alienate longtime fans too. The perk system’s been completely overhauled, and the “Choose a Class” menu is an absolute mess of icons. Also it might just be me, but it felt like players went down a lot more in my matches, even on Normal. That’s great if you want a faster, more dangerous Zombies mode, but it’s one more factor that could push away newcomers. Your pistol and melee swipe are borderline useless by even the third round. Anyway, I’m no Zombies expert. It exists, and I’d like to see more creative settings like Ix and Voyage of Despair. That part I’m 100 percent on-board with, even if I’m not sure I have the patience to learn all their intricacies. Blackout is the draw though. It’s the reason you should buy Black Ops 4. I already wrote at length about Blackout during last month’s beta so I’m not going to spend too much time on it here. Suffice it to say, it’s like Playerunknown’s Battlegrounds but polished. No, really. Surface-level it’s so much like PUBG. It has the same nondescript grassy hills look, broken up here and there by generic suburban houses and gas stations and whatever. There’s a blue circle that closes in on you every few minutes, collapsing the playable area as people die off. A hundred people parachute into the game from helicopters with zero equipment, then scrounge for the weapons they need to survive. But it’s PUBG as done by Call of Duty, meaning the first-person combat feels snappy and precise, the movement speed is faster, and matches tend to wrap up a lot sooner. It also means fewer bugs and fewer cheaters (at least for now). And I can’t say enough good things about the menus. 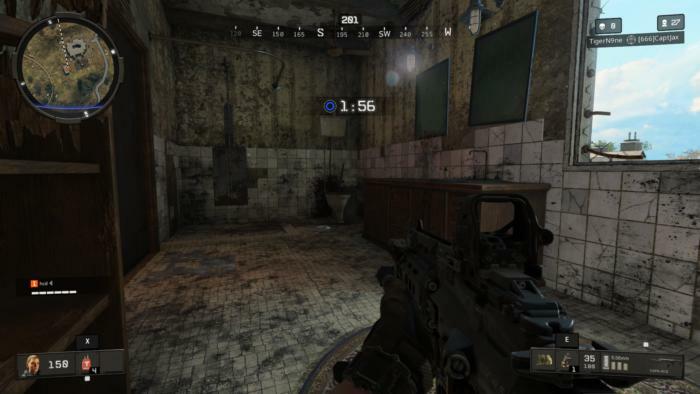 Blackout succeeds so well here at something PUBG’s always struggled with. Got a weapon in your hand? All you need to do to equip a scope is find one, then tap F—and voila, it auto-equips the scope to your weapon. Don’t want that? Hit G instead and it goes in your inventory. There’s also a keyboard shortcut for medical items, and a handy HUD element tells you how many you have left. Tab pulls up your full inventory as an overlay, so you can quickly adjust what you need and go back to fighting. Hiding in a bathroom. Classic battle royale. I don’t really enjoy Fortnite, but I’ve been sort of drawn to it if only because I wanted to play a battle royale game without PUBG’s jank. 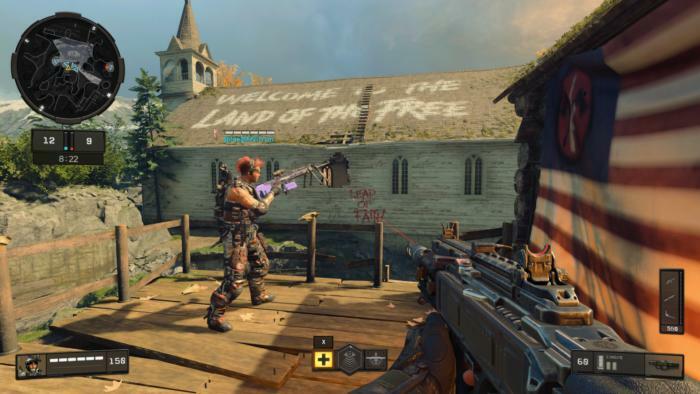 Little did I know Black Ops 4 would end up being that game. I’m not sure how long I’ll personally be playing it—I feel like I got my battle royale fill last year, and Blackout might be a bit late to the scene for me. That said, I’ve spent days playing it already (if you count the beta) and I’m still not tired of it. 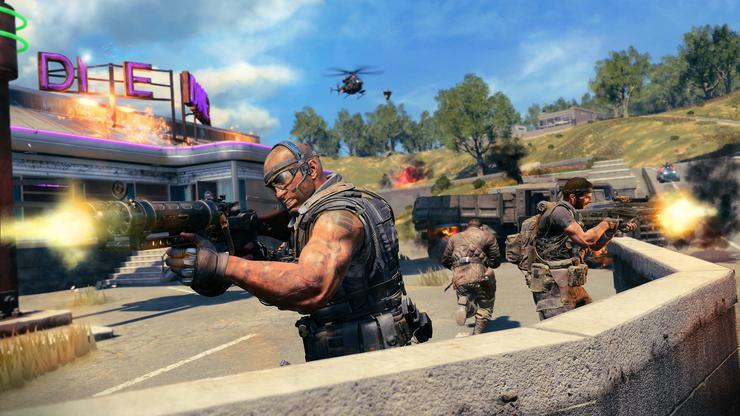 PUBG’s tension remains intact here, it’s not nearly as cartoony as Fortnite, but small improvements make Blackout a much better version of that experience. Big-budget takes on battle royale were a given, but I never expected Call of Duty: Black Ops 4 ($60 on Humble) would be so successful at it that it would make the other modes feel superficial. Here we are, though. Blackout is the best part of this year’s Call of Duty package, and might even justify the cost of entry even with no singleplayer campaign. It hews very close to PUBG’s mold, maybe a bit too close for those who already have battle royale fatigue, but it repackages those ideas in the most polished form I’ve seen so far. As for the rest? Standard Call of Duty, I guess. Traditional multiplayer, Zombies mode—I suspect after a decade-plus, you probably know where you stand on these two. The former is perfectly competent this year if lacking in cohesion, while the latter boasts some of the more impressive maps I’ve seen to-date. I’ve had one crash-to-desktop but nothing too serious. Performance is buttery smooth, which isn’t surprising given it’s usually the singleplayer campaign that taxes hardware, if anything. Not much danger of that here. Overall it’s a pretty great year for Call of Duty, even if it feels like the once-dominant shooter series is now playing catch-up to an industry that left it behind. That may be the case, but Treyarch did a damn fine job catching up at least. I’m uh...still down for a singleplayer Call of Duty campaign though. Seriously Activision, there are dozens of us.